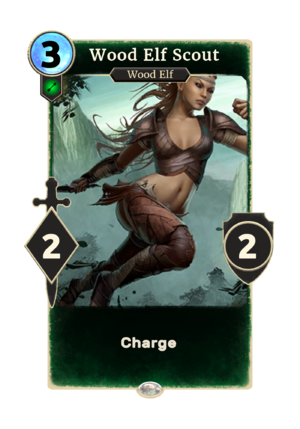 Wood Elf Scout is a common Agility creature card. It is not obtainable, but is summoned by the Camoran Scout Leader, and it is one of the opponent's cards in A Knife in the Dark. "I will secure the area." This page was last modified on 16 February 2019, at 16:04.